For several decades now, the game of air hockey has thrilled and excited arcade-goers of all ages, shapes and sizes. It is one of the few games in which size and strength offers no real advantage. Thus, it is not an uncommon sight to witness strapping male teenagers being absolutely humiliated by their relatively frail and dainty girlfriends—an eventuality that can lead to all kinds of taunts and shame. Despite the taunts and boasting, playing the game of air hockey can be a gleefully fun pastime, one defined by a fast-action pace and a fairly high degree of cardiovascular exercise. It is also a great way to spend a hot summer day—a raucous air hockey tournament within the confines of a cool air conditioned room. For these reasons and more, owning a quality air hockey table can be a lot of fun. Not only do children and teenagers love playing the game, it also makes for a nice diversion at adult get-togethers and parties. However, if you do own an air hockey table—or if you intend to purchase one—you will need to add cleaning and maintaining your new machine to your regular list of chores. And while this may seem like a laborious and time consuming task, it can actually be accomplished in just a few easy steps. To illustrate this, below we have created a step-by-step guide for cleaning and maintaining your new hockey table, and explained the reasons behind each of these required cleaning steps as well as a couple of tips for keeping the table regularly maintained. A clean air hockey table will enable the machine to perform at its best. On the flip side, a dirty table can cause all sorts of problems. Here are just a few reasons why cleaning your air hockey table is a good idea. Dusty air hockey tables can cause drag, preventing the puck from gliding as designed. Dirty tables can cause the air holes to become blocked or clogged, stopping the air flow that makes air hockey possible. Air hockey tables that have dirt and other particles on them can cause the puck to jump and even fly off the table. Most air hockey tables are constructed from some type of metal or composite material. Moreover, the legs and other support pieces, which hold the table up, can be made of aluminum, plastic or, in some cases, even high-grade stainless steel. When dust and other minute particles are collected on the face of the air hockey table it can not only hinder the manner in which the plastic puck slides over the table; it can also cause scratches and dings—usually from the dirt and other particles being pressed deep into the face of the table by the hard paddles. To avoid these negative consequences, below we have compiled a step-by-step guide for cleaning and maintaining your new air hockey table, a guide that begins with turning the machine on. Before you begin to dust the air hockey table, be sure to switch it to the “on” position. This will commence the air flow, blowing out of the small holes in an upward direction, and will keep any dust or dirt from settling into those holes. One of the best first steps in cleaning an air hockey table is with the hose of a vacuum. By suctioning any dirt, dust and particles off the table you can lessen the chance of any dust falling into the holes and potentially clogging them. To complete this step, simply turn on any household vacuum or Shop-Vac and adjust it for suction. Next, take the hose and hover about one inch above the face or top of the air hockey table and methodically cover every square inch in this manner. Try not to let the vacuum hose touch the table, as this can cause scratches and may cause dirt to fall into the holes. Once you have completed vacuuming the air hockey table and removing the majority of free-floating dust and particles, you can then remove the rest of the debris through dusting. With the air hockey machine still on and running, you will want to remove any dust, dirt or stuck-on particles from every area of the machine using a soft, dry, non-abrasive cloth. For best results when dusting, a microfiber cloth works very well, as it catches all the dust without risking damage to the table. In a pinch, however, an old rag or even an old T-shirt can do the trick. Be sure to wipe the entire table with this dry cloth, including the top or face of the table, the side and back rails, the goal areas, legs and all other support pieces from which the air hockey table is constructed. Once you have removed the dust from the air hockey machine, you may still notice stains on the table, especially if it is played often. 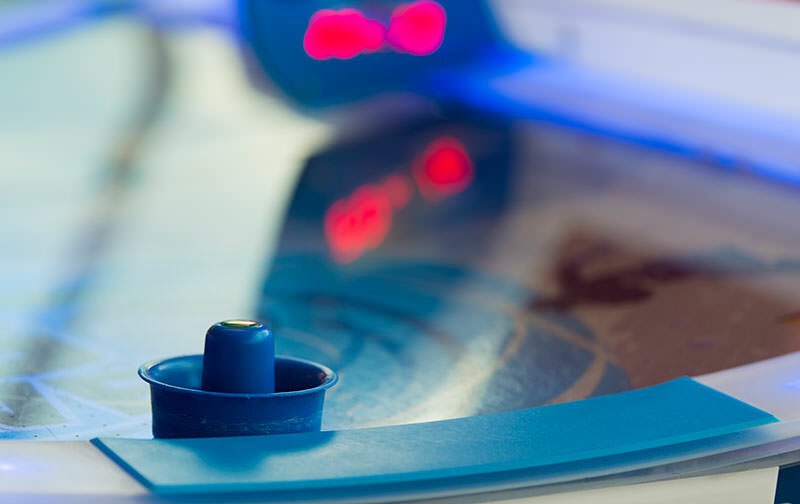 Things like soda and coffee spills, fingerprints, chocolate smudges, etc, can rapidly turn your air hockey machine into an eyesore—one that must be cleaned with a damp cloth of some kind. The correct or best cleaning solution for wiping an air hockey machine is still a matter of debate. Some folks use a mixture of non-abrasive detergent and water, while others use an alcohol-based solution that is marketed specifically for the cleaning of video and arcade game equipment. Still others have turned to furniture polish, window cleaners and other solutions. The key is to choose a solution that is completely non-abrasive, as you don’t want to scratch the machine. This can result in poor performance and a change in the way the puck moves about the table. NEVER use wax or wax-based products on your air hockey table. When wax dries it can harden and cover the air holes of the table. With the machine still in the “on” position and running, spray just a little bit of your cleaning solution onto a soft damp rag of some kind. Begin in one corner of the air hockey table, and continue this process until the entire table is clean and free of stains. Be sure to wash the entire table, including the sides, legs and support pieces. You can also use the solution to thoroughly wash all of your air hockey pucks and paddles. Once you have thoroughly wiped down your air hockey table with your damp cloth and cleaning solution, take a soft dry towel and carefully dry every area of the machine, as well as the pucks and paddles. Although you took extra precautions to ensure no debris fell into the air holes of your air hockey table, there may have been previous clogs. These clogs, which interrupt the air flow through that particular hole, can drastically and negatively impact the manner in which the machine performs. Many people suggest using a toothpick to clear the holes on an air hockey table, but toothpicks can break and become lodged in the hole. Instead, we recommend using a small metal needle to do the job. When clearing the air holes, make sure the machine is still on; this will limit the amount of debris that actually falls into the inside of the machine. Take your needle and, moving horizontally or vertically, methodically clear all of the holes of any particles. Be sure to plunge the needle deep enough into the hole as to completely clear it. Want to Speed Up the Puck? For those who desire to speed the action of their air hockey game, a thin layer of spray-on silicone to the top of the table will do the trick. Remember, though, this should only be done after the table is completely clean so as to not trap any dirt or particles beneath the silicone. Cover the Table. Most dirt and dust collects on the air hockey table when it is not in use. To mitigate this filth, simply cover it with a standard air hockey table cover. If you do not have a cover, a clean sheet or tarp of some kind will do the trick. Dust after each playing session. After a hard-fought contest on your air hockey table, remember to dust it off when finished. When doing so, make sure the machine is still running so that dirt will not fall into and potentially clog the air holes. Keep drinks and snacks off the table. While it never hurts to have a soda or energy drink nearby when playing, try to refrain from setting those drinks and snacks directly on the table. Spills do happen, and soda can cause a real mess at best and ruin your machine at worst. These simple cleaning, maintenance and preventive steps can help keep your air hockey table running at peak performance for a very long time, offering years of competitive fun with family and friends.